The building's original entrance on the avenue had a very handsome portico that was somewhat similar to that of the apartment building at 667 Madison Avenue that was unfortunately demolished for an office building (see The City Review article). 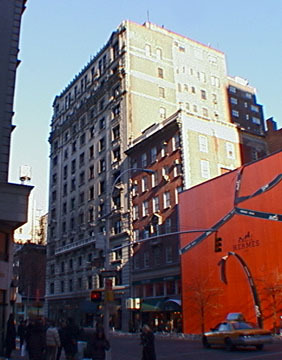 The 10-story apartment building at 667 was built in 1900 and the next year plans were filed by Maximilian Morgenthau for this 12-story building, which would be the avenue's tallest on the Upper East Side at that time. This limestone-clad building was completed in 1902 when its address was 701 Madison Avenue. It was designed by Buchman & Fox. It was designed as an apartment hotel with a rooftop dining room. 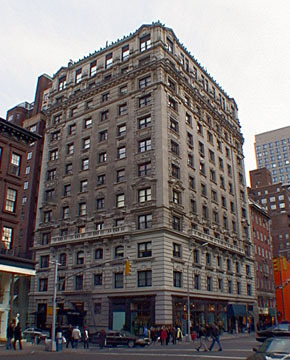 Morgenthau leased it in 1902 to Charles L. Leonori, after whom the building was named. In a February 14, 1988 article in The New York Times that is reprinted in his fine book, "Changing New York, The Architectural Scene" (Dover Publications, Inc., 1992), Christopher Gray noted that the 1922 replacement of the avenue lobby with storefronts with iron Ionic pilasters was designed by Jardine, Hill & Murdoch, "the best work of its type on the avenue." "In 1925," Mr. Gray continued, "the dining room was moved to the ground floor and opened to the public as a restaurant, freeing space for penthouse apartments, then coming into vogue. By this time the major elements of the building had been changed execpt for the rooms and the late Victorian finishes - sliding doors, dark wood trim, heavy ornamentation - now out of fashion in an era of light colors and neo-Georgian detailing....In 1981, a real-estate investment group headed by David Berley bought the Leonori and converted it to condominium ownership in 1983." 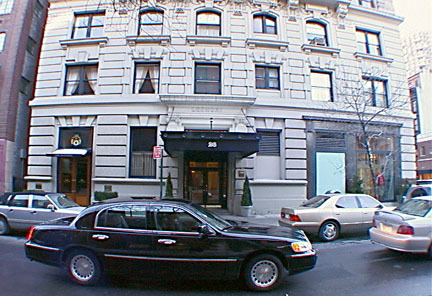 The building was included in the Upper East Side Historic District, given it landmark status, but incredibly the building at 667 Madison Avenue was not and it was demolished by Leonard Stern to make way for a new office building that is attractive but in no way as elegant as the apartment building with its great caratyd statues above its portico that it replaced. The building has 67 apartments, a three-story rusticated limestone base, a marquee sidestreet entrance with a walk-up lobby, some arched windows, and sidewalk landscaping, but no garage and no health club.